Cotton crop is the main stay of Pakistan economy. It occupies a pivotal position in the national economy and plays important role in the economic progress of the country. It is not only a sole source of the survival of a millions of farmers’ families in Pakistan but it also contributes a major share of approximately 65% in foreign exchange earnings. Therefore, cotton is known as ‘white gold’ of Pakistan economy. The growers of Pakistan are suffering huge losses in yield and quality of cotton crop due to various diseases and unaccepted maladies every year. During the previous decade, cotton production experienced many ups and downs. It was at its lowest during the period when it passed through its most serious crisis in the form of cotton leaf curl virus (CLCuV). Recently, a new mysterious malady, commonly known as ‘reddening’ or ‘red-leaf-disease’ is now emerging very speedily and become a serious problem in various cotton growing belts of Pakistan especially in Sindh. The PCCC also observed the new emerging problems like stunning of cotton growth, wilting of the plants and reddening of cotton leaves endangering the cotton production in Sindh. Thousand acres of cotton crop were found to be affected by this complex in major cotton growing belts of Sanghar, Mirpurkhas Nawabshah, Khairpur, Naushero Feroze and other districts of Sindh. This mysterious cotton disorder is known as bronze wilt and was first appeared in the USA, Brazil, Argentina, and Bolivia during the hot summers of 1995, 1996, and 1998. Similar disease symptoms were seen in peanuts and soybeans. Because of its symptoms, it has called ‘reddening’ or ‘red-leaf-disease’ in Pakistan, “copper top,” “early foliar decline,” “sudden wilt” and “phloem wilt” in the U.S. and “red leaf,” “red wilt” and “anthocyanosis” in other countries. 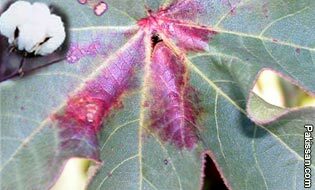 The disease, which causes death of feeder roots and deficiencies of phosphorus and potassium in tissues, took its toll on cotton grown in Arkansas, Georgia, Louisiana, Mississippi, South Carolina, and Texas. In 1998, cotton losses in Georgia were valued at nearly $25 million. Even Pima varieties of cotton grown in Arizona and California showed yield losses that year. The common symptoms have included wilting, reddening of stems and leaves, leaf and fruit shed, and a higher temperature of the leaf tissues and the plants grow poorly and may produce no bolls. Bronze wilt is related to restricted water transport in the plant and manifests itself with numerous symptoms. One of the first and prominent symptoms to appear is the bronze or red color on the first fully expanded leaves near the top of the plant. In the upper part of the plant, there will be some rugate leaves, which means the area between the veins, will be raised, giving the leaf a rough appearance. The stems turn red all the way to the top of the plant, giving an appearance similar to that following an application of the herbicides. Another very noticeable characteristic symptom was the absence of flowers or squares. However, the affected plants can have bolls. Bronze wilt plants will be stunted. Usually plants devoid of fruit due to lygus damage will be tall due to not having a sink for the photosynthate produced. This is just opposite the effect shown on bronze wilt plants. The diseased plants will wilt and may eventually die. The exact cause of the disorder has yet to be unknown. Both biotic andabiotic factors have been proposed as possible causative agents. Generally it has been believed that plausible cause of bronze wilt is high concentrations of certain strains of Agrobacterium spp. (Agrobacterium tumefaciens), a soil and seed bacterium, that cause damage to the secondary roots. Differences in resistance to bronze wilt are influenced by cultivar, environment (temperature, light intensity, and photoperiod), production practices and abiotic stresses (high temperature and water stress), soil type and fertility, relative nitrogen content of fertilizer and fertilizer ratio of phosphorous and potassium. Potassium deficiency frequently has been mentioned as a primary suspect. Plant age, fruit set and load, earliness in fruiting and maturity, and high yield potential also effect symptom severity. Bronze wilt flourishes when daytime temperatures are above 95 °F for 2 to 3 weeks, which enhances foliar bronze wilt symptoms, and necrosis and browning of fine roots. Necrosis of fine roots reduces the ability of the plant to actively take up water and nutrients, such as potassium and iron. Water availability to the plant is very critical, bronze wilt is more severe under drought conditions and heat stress. No doubt, the complete and reliable solution to this problem is resistant cotton varieties. Though our agricultural research institutes have evolved more than 50 registered cotton varieties up to 2003, but unfortunately most of them are susceptible to this malady. Consequently the government has allocated Rs24.1 million for managing reddening malaise of cotton leaves, but a period of some twelve long years is required to evolve a new cotton variety. Currently, there seems to be no variety fully resistant to this disease, therefore government needs to be heedful and careful for the preventive measures against this disease for the next crop. There is basically no cure. If any of the varieties known to show the symptoms are planted, they must never be allowed to stress. It appears that the incidence of this problem is worse when the plants have a boll load and are put under a hot-dry stress or just a heat stress. Perhaps low potash can influence this as well. Only the variety selection is the best means of prevention. Avoid planting the susceptible varieties. Planting varieties that have no known history of bronze wilt is the easiest way to reduce losses from this disease. In the absence of disease resistant varieties, the immediate solution for reducing the severity of disease lies in the adoption of modern agricultural techniques and management practices. Deep plowing, clean cultivation, sowing at recommended time, seed treatment with proper fungicide, adequate manuring, proper plant spacing, judicious irrigation, and balanced and timely use of fertilizer can reduce the risks of disease. Bronze wilt severity is directly proportional to nitrogen fertilizer rate and inversely related to phosphorus rate, hence application of balanced fertilizer of nitrogen, phosphorus, potassium and sulfur, are important to reduce bronze wilt severity. Use of potassic fertilizers and foliar application of micronutrients, especially zinc, boron and copper at recommended rate and at specific growth stages, as practically experienced by the writer during several field experiments, have proved quite beneficial for reducing the malady. Plant at recommended time to avoid high soil temperatures during fruiting. Balanced and timely use of fertilizers, especially use no more nitrogen fertilizer than is appropriate to achieve desired yields. When soil tests indicate deficiencies, fertilize with phosphorus, potassium and sulfur before planting. Prevent water stress by irrigating sufficiently. Susceptible cultivars can still suffer considerable losses in spite of good cultural practices if climatic conditions favour the disease. Diseases are an annual problem that reduces yields, quality and economic returns to producers. Research is needed to provide a better understanding of factors that influence cotton diseases and to develop management strategies that reduce economic losses. Our cotton scientists are aware of the problem and are working on it. However it must be remembered that there is nothing to do to control the problem once observed.